...Maki, from Final Fight 2! The two fight and Maki proves to be a dangerous opponent, as she uses a tonfa in battle (this was her best weapon in Final Fight 2). Things even up a little when Sakura starts throwing fireballs at Maki, to try and keep her at a distance. As the two clash again, Maki says that the style she has learnt (Bushinryu) was designed for survival against multiple opponents. Sakura realises that if that's true, then Maki wouldn't want to use kicks, as they'd put her state of balance at risk. As Maki says that's ridiculous and tries to kick Sakura, Sakura uses her haru ichi ban move to knock Maki back. As Sakura recovers from her move, she realises that Maki has gone. However, she then hears Maki's voice, telling her that she'll be more careful with what she says in the future. But she can claim a victory here so she can go and fight more opponents and gain more fighting experience. Guy also makes a very small cameo -when Maki explains to Sakura about her fighting style, several silhouettes of him are shown. Sakura Ganbaru has been translated into English by Udon Entertainment. It is two volumes long, but the first volume is the one with Maki in it. Maki's appearance here would help the character become popular, and she would eventually return to the game series when Capcom Vs. SNK 2 was released. 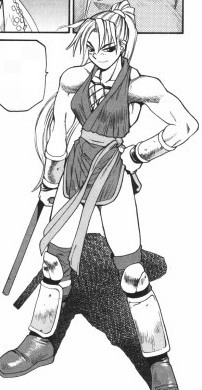 In that game, she has a tonfa equipped all the time, as she does in this manga.